I have a Buck 119BKS that I received as a gift. 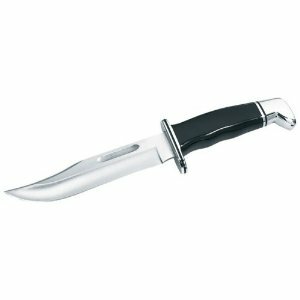 I like the knife in general, but find that the handle is slippery when wet, and the mounting has many reflective surfaces that glint in a way that I don’t think is desirable for an outdoorsman’s knife. To remedy this, I performed a simple and reversible mod using materials I had on hand. 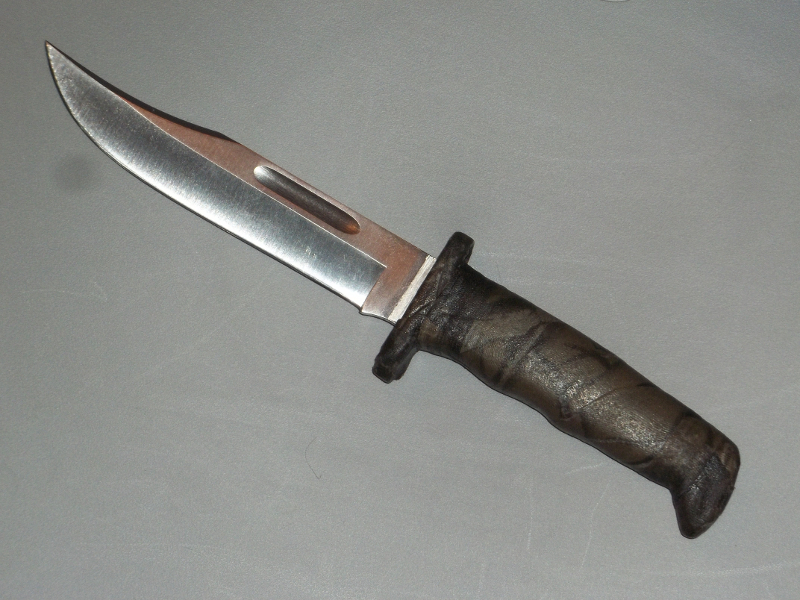 First, I wiped the knife down with alcohol and wrapped the handle with an old roll of Allen Realtree cloth tape . This cloth tape feels a bit like some medical and sport grip tapes I’ve used, so those may be valid substitutes. I started with the crossguard and hilt, trying to get the flat but stretchy tape to conform to the curves of the knife. I then wrapped the middle to overlap and secure tail ends. The tape was not as sticky as I had hoped, perhaps due to age, so it did not stay perfectly formed in some places where I had to fold or press it in. If I were to do this project again, I may use some kind of glue to aid adhesion, or a stickier tape. I then used masking tape to protect the blade and applied several generous coats – perhaps ten or so – of Minwax polyurethane spray, until the handle was smooth. This helped to tack down the edges and ends of the tape, and I hope it will reduce fraying or lifting during use. After allowing it a day to dry, I noted that the coat turned out to feel more rubbery than I had expected, but I proceeded according to plan anyway. I scrubbed the taped surface with 220-grit sand paper to bring down the high spots where the tape overlapped, and to restore texture to the polyurethane-coated surface. Were I to do this project again, I might try a clear lacquer , which should dry harder. The end result, pictured here, turned out well enough. It’s a bit rough around the hilt and guard, where I had the most trouble wrapping tape. However, the meat of the handle is very grippy, even wet, and the subdued color and texture of the fabric tape won’t throw off any light when the knife is sheathed. I’m satisfied with the results and will see how it holds up. If I had been willing to spend any money on this project, I might have invested in Plasti Dip or some sort of heat shrink tube grip to cover the handle. That’s all I’ve got for now. I’ll update here after awhile if I have any problems.